I feel blessed that I grew up with a normal skin due mostly to my family’s genetics (thanks Ma and Pa!) and some basic facial regimen that I do daily. But because there’s just too much pollution, sun’s crazy UV rays, unhealthy diet (I can’t help eating those junkies sometimes), lack of sleep and other lazy habits that my skin can handle, no amount of genetics can prevent me from having that dry and flaky ‘Sahara Desert’ of a face. Since I couldn’t remember the last time I had a decent facial, I thought it would be nice gift for myself to make a trip to a facial salon. So I texted my highschool friend, Giselle, to come with me and have a facial in Ruiz Derma. Why Ruiz Derma? This would be the first time I would try them. While other spas have been down-and-out due to unpredictable economic times, this spa has been in business long before big malls became mainstream in Cebu in the late 80s. So I can say, this spa is one tough cookie in the spa and wellness business. 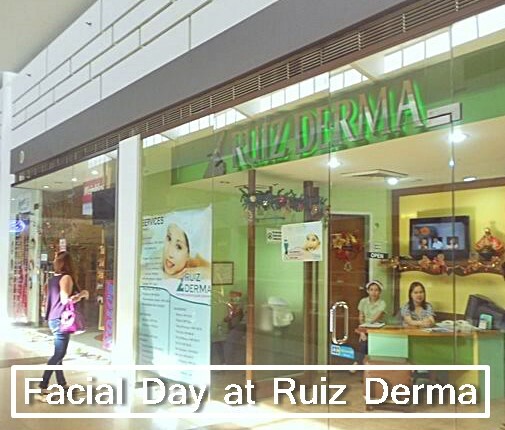 We met at Ruiz Derma yesterday and had a quick look at their services. They’ve got many options to choose from. It would be nice to try the others some other time when I have more time and money to burn. I chose the “Honey Purifier Facial” priced at P699 (which is their signature basic facial) while Giselle chose the “Diamond Peel Facial with Cucumber” priced at around P1000+, I think. Off we went to our respective cubicle (individually separated by what looks like hospital curtains) with our respective estheticians. Hmmmm. I love it here. My first esthetician primed my faced by cleaning it with a facial cleanser and later on steaming my face to open up the pores to easily remove stubborn dirt and dead skin cells. She informed me that another one would come in to finish the facial treatment. I like my second esthetician, Nila (or was that Nida?). She’s very friendly and professional at what she does. She was nice enough to answer all my questions because God knows what sort of nasty ‘I-can’t-even-pronounce-this’ chemicals that has been applied to faces of unsuspecting customers in most shady spas these days. Rest assured, Ruiz Derma is worlds apart from these run-of-the-mill spas based from my observations. She then worked her way softly massaging my face with facial scrub which reminds me of St. Ive’s Apricot Scrub that I used at home. But I think theirs was more fancy smelling. She washed it clean and dry then another round of steaming which to my estimate took about 15 minutes. Hmmm, they are really big on steaming. I could just imagine the size of my pores as big as the sinkhole right now. And the cloudy steam is making me sleepy. I’ve read from a reliable source that honey is great on the skin because it acts as antibacterial which can help fight acne and reduce skin infection. It is also suitable for all skin type and makes for a great moisturizer. And you’re gonna love the classic sweet smell of honey, too! I know I did. After the honey mask has dried up for a couple of minutes, Nila wiped it clean with a wet, heavy cotton before moving on to the best part—extracting whiteheads on my nose. Finally, these long-time nemesis are exterminated (Evil laugh)! Good riddance. The entire treatment was capped off with a cold tube lightly rubbed on my face (apparently to close the pores) and astringent. Then ta-da! My face is squeaky clean and feels baby-soft again. I honestly find them to be one of the best spas in town that I recommend you include in your list. The service, friendly staff, cozy ambience and the convenience (it’s located inside SM City Cebu so you can visit them after shopping) is just right for the price I paid. The first person you’ll meet once you step inside is one of the owners herself, Dr. Dana Ruiz who is friendly and approachable so you won’t find it frustrating to voice out should you have any questions about their services. FYI, for those who don’t know her, she also regularly contributes in an advice column in Sun Star every Sunday. Everything was right except for a minor flaw. It was almost 5 pm when we finished and we started at around 2:30pm. It was suppose to be just 60 minutes session but took us almost 3 hours to finish. Not that I’m complaining because Giselle and I have no scheduled plans right after. So, I suggest that plan your day ahead and expect some delays or better yet, inform your esthetician for any appointments after your facial. If you’re still unsure which spa to go to for a thorough facial treatment (expect to spend a big chunk of your time here) then head on to Ruiz Derma. It’s the place to be.